GREAT VIBE, BEST VIEWS, EPIC FOOD! Award winning chef Graeme Riki has made his mark in Tairua, revamping the historic building that is now home to Tairua Beach Club. 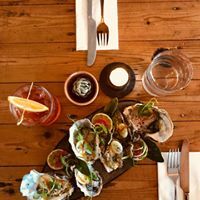 With a focus on putting a creative spin on local flavours, Tairua Beach Club use fresh local produce, like mussels, oysters, crayfish and seafood. Tairua Beach Club’s aim is for their food to make people happy. Having won over the locals and visitors to the area alike with glowing reviews, we think they are doing just that! At Tairua Beach Club you will discover a great vibe, a polished front of house team, and an epic drinks list including some off the chart Coromandel cocktails. Make sure you put Tairua Beach Club on your list of must do’s!